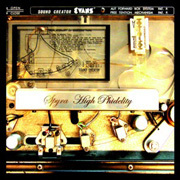 Listening to High Phidelity it is easy to hear Spyra drawing upon techno influences as much as the mysterious moods of the spacemusic realm. He views the body and mind as parts of the same organism, and the medium of electronica as a path between many stylistic directions. On this double live CD, Spyra explores the boundaries between opposites, and manages to realize music that is always inviting and consistently engaging. Made up of concert excerpts drawn from 2007 activity, High Phidelity finds Spyra playing with space on STAR'S END, bursting with color and inflection at E-Day, soaring along melodic lines and dancing shapes at Hampshire Jam and weaving beautiful leads amidst complex interlocking patterns and repetitive motifs at The Gatherings Concert Series. The sound is vibrant, simultaneously loose and ordered, and with a tight grip on the groove. Spyra gives us the spacey and the dancey, but never the same way twice.